NGWENYA- (Siswati name for "crocodile") A small group of Swazi craftsmen and women - with age old artistry breath life into enchanting interpretations of the animals of Africa, imbuing each with its own irresistible personality. Each item is handmade from 100% recycled glass, most of which is from Coke bottles, gathered from all over Swaziland. 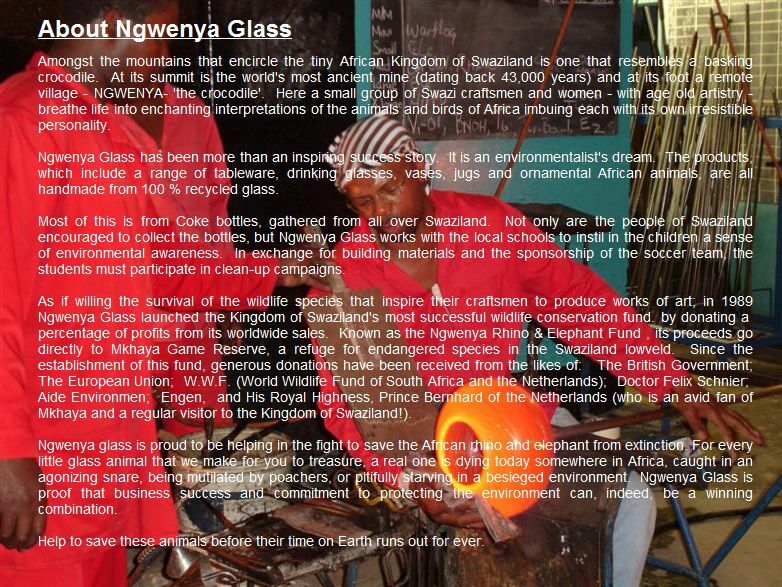 Not only are the people of Swaziland encouraged to collect the bottles, but Ngwenya works with the local schools to instill in the children a sense of environmental awareness.